The events posted on this page are open to the public. If you only want to view Guided Walks, please select “Categories” in the top left hand corner. Click on “Guided Walks” to filter out all but the walks displayed on the calendar. You can change the view (month/day/week/agenda) by clicking on the calendar icon at the top right of the calendar. You can also easily print from this utility. In the Agenda view, you can also collapse all of the events to easily scan the brief information. Please click on the event title in the calendar to see the additional information about each event. Most of these are not North Texas Master Naturalist events but we have made every effort to ensure accuracy. The hosting organization which is listed should be your primary point of contact about these events. If you have an event which you would like to have posted on the public calendar, please send an email to contact@ntmn.org with the details. Members who want to see ALL of the events (AT and VH) should log in to the Members side of the NTMN website. 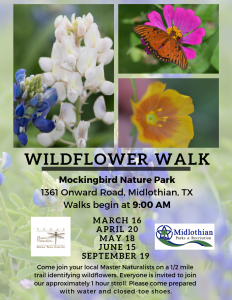 Join the Indian Trail Master Naturalists on their Third Saturday Wildflower Walk at Mockingbird Park in Midlothian. Walk starts at 8:00 AM in the butterfly garden at Mockingbird Park and consists of a ½ mile trail identifying wildflowers. Everyone is invited to attend, and there is no charge. Bring drinking water. Closed-toe shoes and insect repellent are recommended. If the weather is rainy, the walk is cancelled. Walks are held March through September. The Level 1 class of the Native Landscape Certification Program, Introduction to Native Landscapes, will be held April 20 in Boerne. This class covers the benefits of including and preserving native plants in landscapes and building wildlife habitat; distinguishing between sustainable and conventional development; and the Texas ecoregion, including soil type. The class consists of an indoor training session and a 2-hour outdoor plant walk. The class is sponsored by the Native Plant Society of Texas (NPSOT). Above classes also approved for 6 hours AT. Only participants who have completed Level 1 may attend Level 2 or Level 3. Fee for Level 2 or 3 is $50 for NPSOT members or $65 for non-members. Marcos Estrada, Coordinator – Zero Waste for the City of Dallas Office of Environmental Quality and Sustainability, will provide information about recycling and its impact on our city and environment. This month’s nature talk will be Wild Orchids Grow in Texas. Presenter Stephanie Varnum will describe these beautiful plants and give some ideas about where and when to find them. Free with paid general admission and to Heard members. Master Naturalist Bob Richie will lead this foraging walk. We will search out and try some of the edible plants that grow naturally in the area and discuss some useful and medicinal plants that can be found as well. Register by email to Linda Dunn at ldunn@wetlandcenter.com or call 972-474-9100. Do not include drive time. Jeff Quayle will lead a hike at Penitentiary Hollow at Lake Mineral Wells State Park on Saturday, April 20. RSVP to website below to reserve a place. Jeff recommends hiking boots and long pants. We will meet in the parking lot of the picnic area at Penitentiary Hollow. Join us on the John Bunker’s Pond trail. Learn about the natural and cultural history of the area as we walk this 1.8-mile loop trail. The trail begins with a walk through a forested area to a true bottomland hardwood forest, then follows the East Fork of the Trinity River and ends on Wetland levee roads. This trail is great for families and those who are interested in learning about native trees, flowers, animals and anything else found along the way! Free with $5 admission. Members are free. For information, contact Linda Dunn at 972-474-9100 or ldunn@wetlandcenter.com. Directions: Take I-635 or I-20 to Hwy 175 South toward Seagoville. Drive past the Seagoville exits; then exit on FM 1389 South. Drive approx. 2 miles to Martin Lane. Turn left onto Martin Lane and proceed to the John Bunker Sands Wetland Center on the right. The Coppell Nature Park BEC programs are free and open to the public. Registration is not required. Coppell resident Lou Duggan will share his experiences with solar from service provider to results, with actual costs and savings. Carolyn Oldham and Jerri Kerr walk you through creating proper habitat with appropriately chosen plants to attract not only the native, but also the many visiting hummingbirds that we have in North Texas. Admission is $5, $3 seniors. For more information including registration link, go to the Events Calendar at the FWNC website below.